By now it should come as no surprise that my focus when it comes to health and well being revolves around gut health. I've written about this in other posts. For my body composition, I find that I function optimally on food that's mostly cooked and consuming only some of it raw. This changes according to seasons, but even on mild days, my body craves light soups. On wet, spring days, I especially want something warming. While there are those who believe food should be eaten raw, I find a lot of uncooked food to be hard on digestion, leaving me bloated and uncomfortable. Thyroid Health: I touched on this briefly in this post but cruciferous vegetables in particular can be taxing on the thyroid. These include: Brussels sprouts, cauliflower, broccoli. Several leafy cruciferous vegetables such as bok choy, collard greens, kale, red and green cabbage, chard, turnip greens, arugula, mustard greens, savoy cabbage, Chinese cabbage, rapini, watercress, radish, horseradish, turnip, rutabaga, wasabi and Oriental radish. When consuming these vegetables in small amounts there is an increased need for iodine. When consumed in larger amounts, they can wreck the thyroid gland as it may become enlarged as a result of it trying to pull iodine out of the bloodstream. Digestive Health: Unlike cows or other mammals that have several stomachs to help break down raw food, we only have one and ours is not well equipped to properly break down food in order for the gut to optimally absorb nutrients. Consuming mostly raw foods that are high in cellulose, will lead to constipation, bloating, indigestion, fatigue, allergies, weight gain. Inability to absorb nutrients: We could literally starve the body of nutrients while eating all the right foods by not properly preparing them. By cooking most (but not all) vegetables we ensure that a certain amount of digestion has already occured before we take the first bite. "Vegetables and legumes represent one of the most important components of the human diet. Being informed about their characteristics can improve the health benefits, helping to reduce the risk of cardiovascular disease, type II diabetes and some cancers. Recent studies have demonstrated that the method of preparation and cooking can improve the nutrition quality of food." Cooking vegetables in the form of soup, not only softens them allowing your body to do less work, but also provides a good amount of water to your system, which is critical for your colon to function. 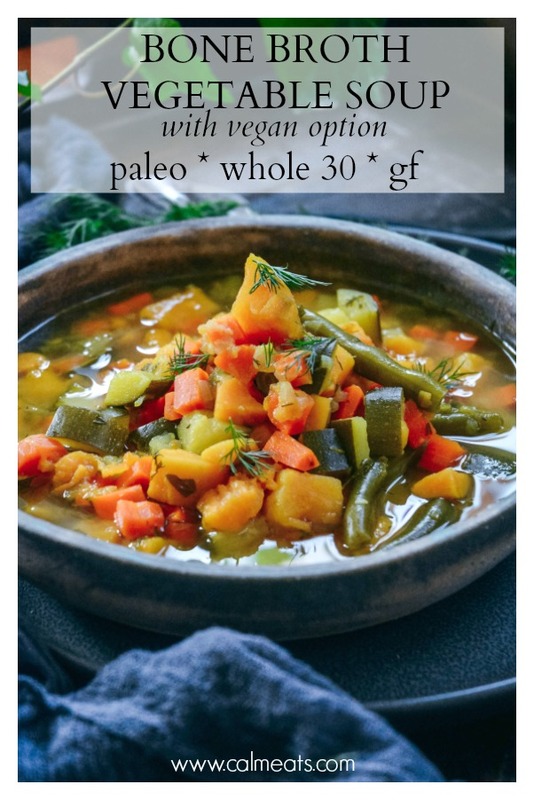 In addition, I cook my vegetable soup with bone broth, which packs additional nutrients. For a full recipe and variations for making bone broth, please check out this post. In Ayurveda and also in Traditional Chinese Medicine, eating too many raw foods is said to adversely affect the body by creating a burden on the digestive system. Cooking certain vegetables can actually unlock nutrients that may otherwise not be available. Heating actually helps to break down some of the hard to digest fiber. While some vitamins are inevitably lost during the cooking process there are still plenty retained and I've noticed a drastic improvement in my digestive health. 4-6 cups bone broth (home made or store bought. I've used this brand when I didn't have fresh on hand, but most grocery stores sell some version of bone broth. You can also do 4 cups broth and the rest water, if you want more liquid. * When purchasing bone broth, be sure it is organic. You want to make sure the bones used for the broth are free of hormones and antibiotics. * This soup is fantastic for little ones. One thing I want to note. If you plan on giving this soup to babies/toddlers, either skip the turmeric or make sure they don't wear anything you don't want stained. Kids are messy and turmeric stains (TRUST ME). Heat a large soup pan over medium heat, add the oil and onion and sauté until translucent but not burned. About 5 minutes. Add the rest of the vegetables, herbs and spices and cook for 2 more minutes. Add broth and bring to a boil. Reduce heat to low and let cook for 30-45 minutes. Finish with fresh squeezed lemon juice. Store in air tight container in the refrigerator for up to a week.